Waterproofing your basement or garage is a key step in protecting your home and personal possessions from water damage. Among the ways to accomplish this task include the application of waterproof paint to the walls and floors. Several types of waterproof paint exist on the market with varying degrees of durability and price. Some paints also contain potentially hazardous materials, so follow proper safety procedures when using them. Masonry paint is designed to adhere to brick, concrete and other hard surfaces in and around the home. The paint is made waterproof through ceramic material, and latex that is added to the paint to prevent water and other liquids from being absorbed. These paints are also mildew resistant and are cleaned easily with soap and water. Many masonry paints also carry extensive manufacturer's warranties in case a problem should arise from a faulty batch. Epoxy paint is most commonly used for basement or garage flooring because of the paint's durability and water-resistant capabilities. Epoxy is a type of plastic resin added to the paint to create a rapidly hardening compound when it is applied to a surface. The resin forms a durable, waterproof seal that will adhere to stone, metal and other surfaces like concrete and cement. According to the Basement Flooring website, the most durable epoxy paints are generally the most expensive, though a water-based epoxy can provide a more economical solution that is durable enough for home use. Acrolein elasticized paint is a waterproof paint used on concrete surfaces. The compound also inhibits the growth of mold, mildew and other bacteria associated with the presence of moisture. Acrolein is a toxic substance contact with which can cause throat and lung irritation and damage to the skin. For this reason acrolein is combined with acrylic paints to create a waterproof substance and limit potential toxic exposure. 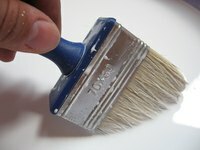 As of 2010, most brands of this paint type are only manufactured in China. Should I Put Waterproofing Paint on My Basement Walls?